Power Consumption: 230 Volts / 1 Phase / 50Hz. Surface Winder Unit For Fabric Rolling On Paper Tube. Features: Variable working width is possible. and can customize as per requirement. 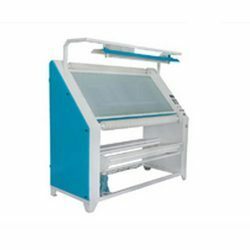 We make fine fabric inspection machines at very good price. Used to check the quality of fabric. The treatment of knit fabrics in tubular form on the SWASTIK TUBULAR COMPACTOR meets the exacting standards set by customers so that garment stitched from the fabric finished on this machine will yield the lowest residual shrinkage values.